Wright Chat :: View topic - Abandon the Grid? Posted: Sat Jan 13, 2018 12:11 pm Post subject: Abandon the Grid? Did Wright ever work without a net...ie without a grid? I that perhaps what separates work of Goff...and later Gehry...is that rejection of the module? You ask a question that requires significant research. DD Martin is, as far as I know, the first instance of a published plan showing a grid, so it goes back that far. After that, they all were subject to the grid, even when it wasn't obvious, as with Taliesin. Winslow seems not to have had a grid, so it must have evolved sometime between Winslow and Martin. Would make for a nice thread here to find where the first grid is firmly established. Monograph 2 doesn't contain gridded drawings of Martin. I wonder where those could be found. expedient -- a mechanical one absorbed in a final result to which it has given more consistent texture, a more tenuous quality as a whole." to suppress or even ignore a unit system, as suits the occasion ? drawings in Laseau and Tice, where wider and narrower units alternate in each direction. in harmony with the site." latter were in fact employed consciously by the architect. Thumbing through the Companion, it seems the only break from a grid in the later decades is with the hemicycle houses. Fitting as my thoughts on grid-ness were sparked by recent reading of the book on Howe, who designed some terrific lozenge shapes. Grids do provide order and rhythm, but they can also be a crutch in the wrong hands. Likewise tossing the grid out can result in some pretty sloppy compositions. Note that the hemicycles are drawn on a radial grid. Grids can take other forms than orthogonal -- as in the 30-60 Usonian plans. The so-called Tartan Grids (a term Geiger rejected) are different from the grids that FLW used. Tartans break down the relationship between major and minor spaces according to Laseau & Tice, and each building would have its own tartan. 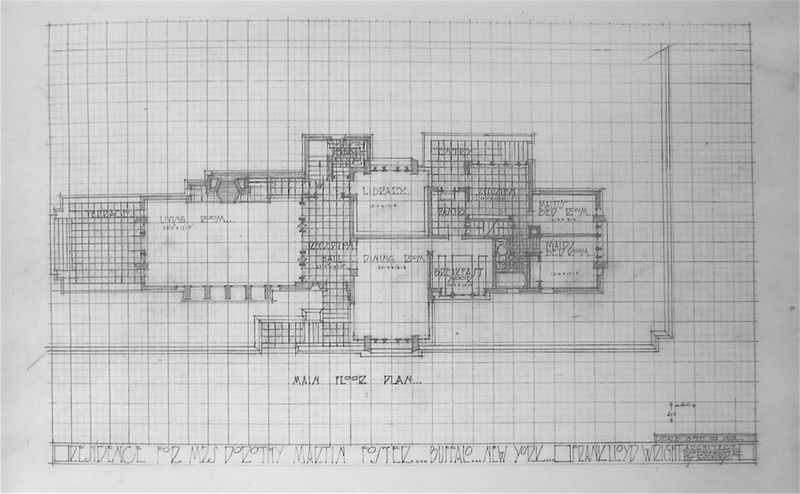 The diagram of Willits, image #1.1 in their book, is not a convincing breakdown of the plan, though it does imply that there was a square grid at work on that house. I would bet the grid began in earnest with the Ladies Home Journal Projects, even though they are not superimposed on the published versions. SDR, Martin has a grid in the Architectural Record article of the 1920s. 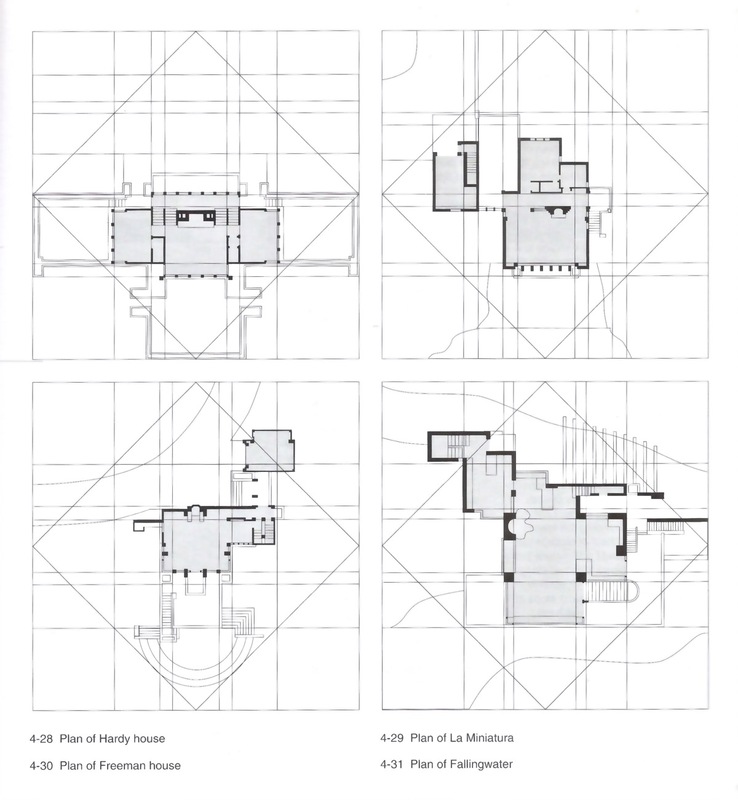 Matt, even the lozenge-shaped plans adhere to a grid of sorts, two, actually, with individual center points along the line of symmetry, each with equal radii, as seen in the Llewellyn Wright House. Quite. These are about as convincing as the "regulating lines" promoted by Jonathan Hale in "The Old Way of Seeing." But they make pretty patterns . . . 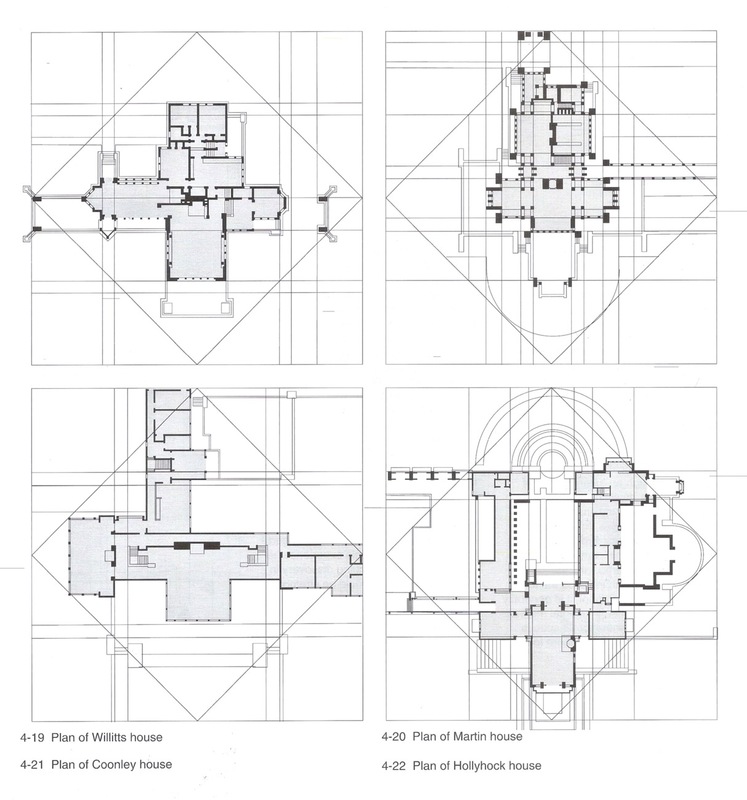 I would love to see drawings of Martin or of Taliesin showing a planning grid. 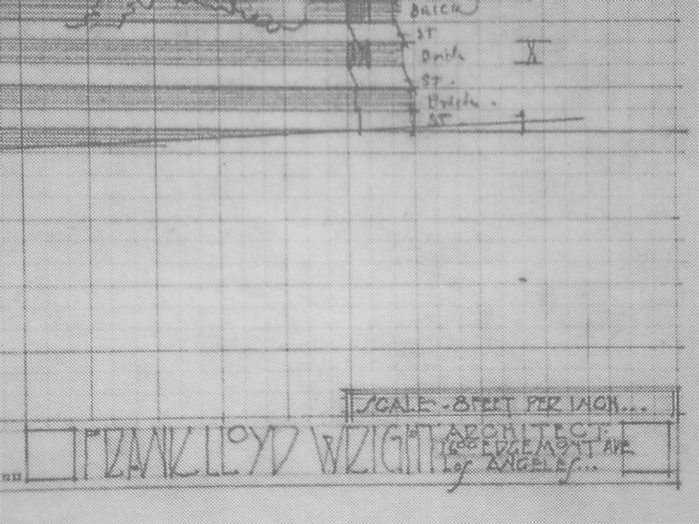 Wright's grids become clear in the Usoninan-period plan and elevation drawings, where they often take the form of numbered (lettered) parallel lines running across the sheet. Drawing sheets for the Dorothy Martin Foster house for Buffalo, 1921-3, are given a prominent "waltz-time" grid extending horizontally and vertically on elevation and plans alike. Never heard of Laseau and Tice. They do make pretty patterns though. Look into "The Grammar of Ornament," by Owen Jones (1865). Wright spent hours tracing the patterns he found in this book, which fortunately for him (and us) presented a very sympatico system of form analysis and generation, based on geometric patterns and systematic elaboration of same. Never heard of that either ...dayum! Some hemicycles have that radial or fanning (?) grid, but others just have a square module with the curved wall drawn across them. It's obvious that Wright preferred the organizing frame a grid provides. It is interesting to consider what he would have done without one. I suspect he would have felt "all at sea." It's very comforting and encouraging to have the sheet of paper suggest where to put a line -- here, or here, but not at some random point in-between -- at least for starters. Both the process and the result will present the advantage of employing a grid, visible or invisible. Yes, there are curved plans drawn on square, rectangular or even triangular grids, and angular plans on orthogonal grids. No rule existed which couldn't be broken. One is comfortable breaking rules which one has imposed in the first place . . . The prime example of a square grid with a curved window wall is Laurent. Winn is a lesser version of the same house. In those designs, the curved window wall is basically a solar collector, but it also serves circulation and affects the placement of the rooms defined by the square grid. FLW went off the grid many times. Bulbulian keeps the square grid, but the living room goes of at an angle, while Edwards' and Neils' living rooms get their own orthogonal grid. Then there's Lamberson, with its square grids taking off here and there, with hex-mod terminals. 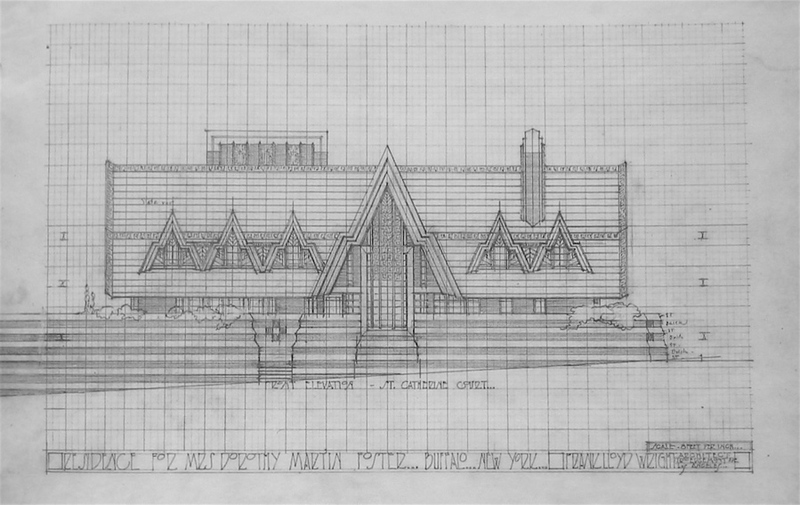 FLW seemed willing to distort all his rules commission by commission. Nevertheless, there is always a grid.